Feast your eyes on the newest addition to my kitchen gadget collection. 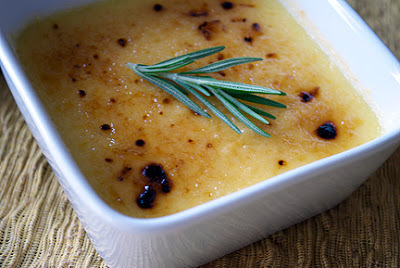 Yep, I finally purchased a culinary torch and today I took it for a test drive on a little creme brulee. Now as much as I would enjoy eating creme brulee daily for the rest of the week, I decided to make a batch just large enough for two. 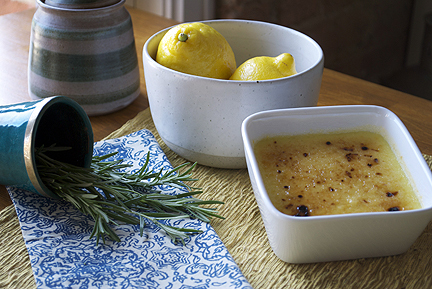 The recipe that I found was for a lemon version, but I also infused some fresh rosemary into it because we all know that citrus and herbs are a match made in heaven. A special thanks to my friend Scott, for use of his food styling props and talent! In a small bowl, whisk together 1/4 cup of the sugar, rosemary and the lemon zest. In a small saucepan heat the cream over medium heat until warm. Do not allow cream to boil. Whisk in the sugar-zest-herb mixture, remove the pan from the heat and allow mixture to cool. Transfer to a small bowl, cover with plastic wrap and chill for at least 1 hour to allow the lemon and rosemary flavors to infuse into the cream. In a saucepan, reheat the cream mixture until warm, making sure the mixture does not boil. In a mixing bowl, whisk the egg yolks lightly and then drizzle in the warm cream, whisking to combine. Strain the cream mixture into (2) 6-ounce, shallow ramekins and place in a small baking dish. Add enough hot water to come halfway up the sides of the ramekins. Bake the custards in the middle of the oven until just set, 35 to 40 minutes. Carefully remove the ramekins from the water bath and let cool on wire racks. Chill, uncovered, at least 4 hours or up to overnight. Remove ramekins from refrigerator for 15 to 20 minutes before proceeding. Sprinkle the 1-1/2 teaspoons of sugar evenly over each of the custards. Using a culinary torch, caramelize the sugar by holding it so that the flame just touches the surface. Start at the center and spiral out toward the edges of the ramekins. If the sugar begins to burn, pull the torch away and blow on the sugar to extinguish the flame. Serve immediately. Caramelizing the sugar evenly takes a bit of practice (I had a few too many charred areas). *Update: after a little research I've found that many resources suggest using turbinado sugar for the sugar crust instead of granulated. I've modified the recipe to reflect this update. If you do not own a culinary torch, don't fret - a modest broiler will also do the trick. Preheat the broiler and remove the ramekins from the refrigerator for 15 to 20 minutes before proceeding. Sprinkle the 1-1/2 teaspoons of sugar evenly over each of the custards. Transfer the custards to a baking sheet and broil about 1-inch from the heat, until the sugar is caramelized, 1 to 3 minutes. Serve immediately. 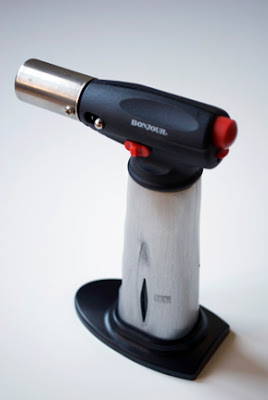 I'm on the hunt for a good kitchen torch, how did you like yours? I really can't complain for the price that I paid. It produced a large flame (which is adjustable) and the fuel was easy to fill. When are you going t be getting a kitchen scale?